As far as Isla Marchant is concerned, Christmas is cancelled. Left standing in the church porch with three redundant bridesmaids dressed in black and no groom in sight, it’s no wonder she isn’t feeling festive. Asked to run The Ginger Cat café in the Sussex village of Charnley Acre while the owners are away, Isla seizes the chance to escape from Nottingham with its constant reminders of what might have been. 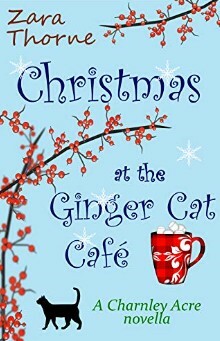 But running a busy café isn’t as easy it sounds, especially when one staff member is out of action with a broken ankle, and the rest of the team consists of eighty-something Horace, as grumpy as they come, and dreamy, lovesick teenager, Molly. When Harry Anderton pitches up in a campervan, Isla finds the perfect solution to her staff problem. Harry isn’t ‘doing Christmas’ either. Fresh from a traumatic break-up, he’d rather sit this one out, thank you very much. Then Isla discovers that as proprietor of The Ginger Cat, there are certain traditions she’s expected to uphold, and her carefully orchestrated non-Christmas looks like becoming, well… Christmas. With Harry by her side, can she hold back her own feelings and give the people around her the celebrations they deserve? And what happens afterwards? Harry’s moving on with his life; can Isla do the same, or is she destined to remain forever looking backwards?